This great figurine is made by Welsh porcelain Company in Wales. Made of hand painted bisque porcelain, and measures 9 1/4" tall. 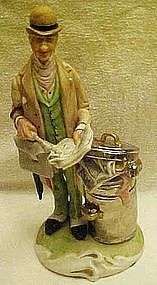 This old English gentleman appears to have lost his fortune in the stock market, but still as ever, is ready to do business as he checks the local trash can for the current stock statistics. Prepared with his briefcase and umbrella he still appears the prideful business man. Pristine condition.